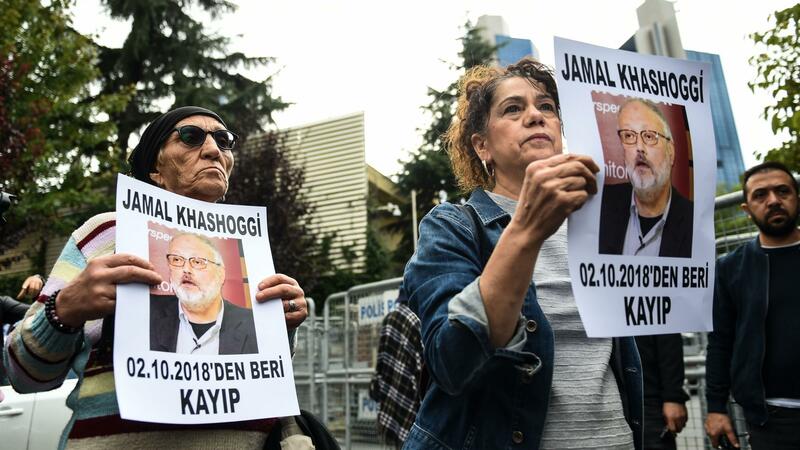 Protesters outside Saudi Arabia's consulate in Istanbul hold portraits of missing journalist Jamal Khashoggi, who disappeared after visiting the consulate last week. Turkish officials say a squad of Saudi men killed him. "We cannot let this happen to reporters, to anybody. And we're going to get to the bottom of it," Trump said. He said the first lady's office was making arrangements to bring Khashoggi's fiancée, Turkish national Hatice Cengiz, to the White House. In the days since Khashoggi disappeared, there have been few signs that the Trump administration was putting pressure on Riyadh to explain what had happened. But in a statement Wednesday, White House Press Secretary Sarah Huckabee Sanders said that National Security Adviser John Bolton and Trump adviser Jared Kushner spoke to Saudi Arabian Crown Prince Mohammed bin Salman yesterday about the matter. Secretary of State Mike Pompeo also spoke with the crown prince "to reiterate the United States' request for information," Sanders said. The Washington Post reported on Tuesday that before Khashoggi disappeared, U.S. intelligence had intercepted communications in which the Saudis had been discussing a plot to abduct him. Khashoggi has been a contributing writer for The Post. But on Wednesday, the State Department said the U.S. had no advance knowledge of Khashoggi's disappearance. Turkish President Recep Tayyip Erdogan has not directly accused Saudi Arabia of disappearing Khashoggi. He said if they have footage of Khashoggi leaving the consulate, they should release it, the Associated Press reports. Meanwhile, a newspaper close to Erdogan published the names and photographs of 15 Saudi men whom it said were sent to Istanbul to kill Khashoggi. The version of events described by Turkish authorities is grisly. One Turkish security official told The New York Times that within two hours of arriving at the consulate, Khashoggi had been killed and dismembered with a bone saw that the Saudi team had brought. He compared the killing to the movie Pulp Fiction. The Post obtained a series of surveillance video clips that purport to show movements involved in the killing or abduction of Khashoggi: the journalist entering the consulate; a black Mercedes leaving the consulate and then arriving at the consul general's house; Cengiz, his fiancée, pacing outside the consulate as she makes phone calls; the Saudi men leaving an Istanbul hotel and getting on planes at the airport. The Post notes that the clips have inconsistent time stamps at one point, are too blurry to make out key license plate numbers and are heavily edited throughout. Khashoggi is a resident of the United States and has been living in Washington, D.C. The journalist is the former editor-in-chief of a Saudi newspaper and was an adviser to Saudi government officials. Khashoggi had written columns critical of the Saudi government in The Post in the past year. In an op-ed published in The Post on Tuesday, Khashoggi's fiancée implored Trump and the first lady to become involved in the search for answers. "I also urge Saudi Arabia, especially King Salman and Crown Prince Mohammed bin Salman, to show the same level of sensitivity and release CCTV footage from the consulate," Cengiz wrote. "Although this incident could potentially fuel a political crisis between the two nations, let us not lose sight of the human aspect of what happened. Jamal is a valuable person, an exemplary thinker and a courageous man who has been fighting for his principles."